will make a positive difference to the Great Barrier Reef. Help the Great Barrier Reef by being the first to adopt a coral or make a donation. 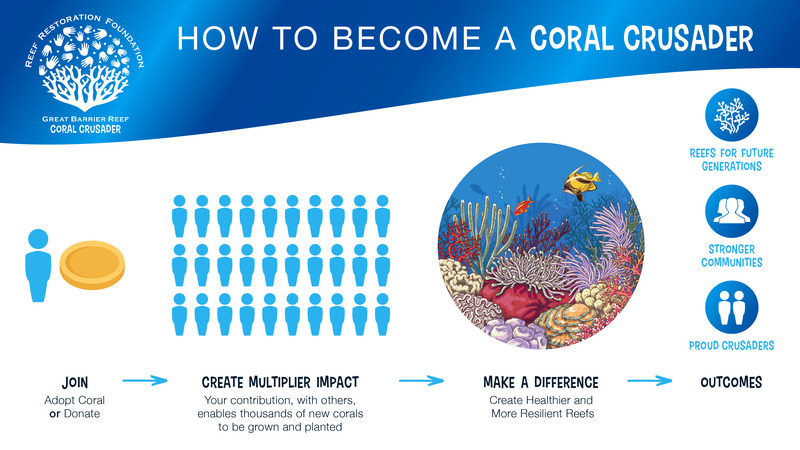 Your investment will combine with those of other Coral Crusaders to create a multiplier effect and allow ocean-based coral nurseries to be established on high-value reefs throughout the Great Barrier Reef. The goal is to grow and plant 25,000 new corals to regenerate damaged corals reefs in 3 years. This will accelerate recovery from the recent coral bleaching events and to better withstand future climate impacts. Support the Coral Nurseries with a one off or monthly donation. "Let us be a generation of action and restoration." - Indigenous Reef Advisory Committee Great Barrier Reef Marine Park Authority.